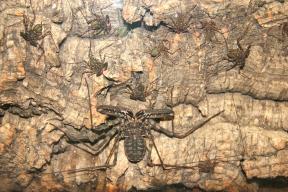 Amblypygids or whip spiders are close relative of spiders (Arachnida: Amblypygi). Like spiders and most other arachnids, the amblypygids have the same basic body structure: two main body parts (cephalothorax and abdomen), eight legs, and palps on either side of their mouth. But the amblypygids have palps and first legs very different from the spiders. The amblypygids have strong, spiny raptorial palps that are used to capture prey and their extremely long, flexible first legs act like antennae to pick up sensory information from their surroundings. Amblypygids lives are centered on the sensory information they acquire through their whips. An amblypygid’s whips are in constant movement exploring their environment. Until recently, amblypygids have been considered to be completely solitary and highly aggressive to conspecifics. Because of my long-term interest in how early mother-offspring dynamics affect patterns of social organization, I began watching the interactions between youngsters and their mother in two amblypygid species. Completely to my surprise, I discovered that (at least in captivity) these species have quite complex communicative and social interactions that last until the animals become sexually dimorphic around 1-year of age! Research on amblypygids in my laboratory has focused on amblypygid social dynamics, kin recognition, and ontogenetic changes in behavior. We have found that in Damon diadema (Family Phrynichidae) there is prolonged association and tolerance between mothers and their offspring, active aggregation, frequent amicable tactile interactions, and kin recognition. In Rayor & Taylor (2006), I coined a term for this long-term, complex, and interactive association between mothers and their offspring as ‘prolonged subsocial’. Immature amblypygids and their mothers form large interactive groups that are in constant tactile (whip) contact with one another. Young D. diadema remain closely associated and highly interactive until they reach sexual maturity at approximately 12 – 15 months, at which time they avoid interaction with one another except when coming together for courtship. Patterns of grouping and proximity change gradually as the amblypygids mature. Agonistic interactions among siblings are mild and infrequent prior to sexual maturity. Young siblings (4 to 6 months) interact constantly and are significantly more amicable than interactions among subadult siblings (10 to 11 months) or within mixed groups of unrelated animals. Agonistic behavior is significantly higher among unfamiliar individuals than among sibling groups. When experimentally disturbed or moved into an unfamiliar environment, young amblypygids immediately aggregate with one another and move closer to their mother. Exploring amblypygid communication and social dynamics is the current focus of this system in my laboratory. Linda S. Rayor. 2007. Family Ties: Unexpected social behavior in an improbable arachnid, the whip spiders. Natural History Magazine. 116: 38-44.